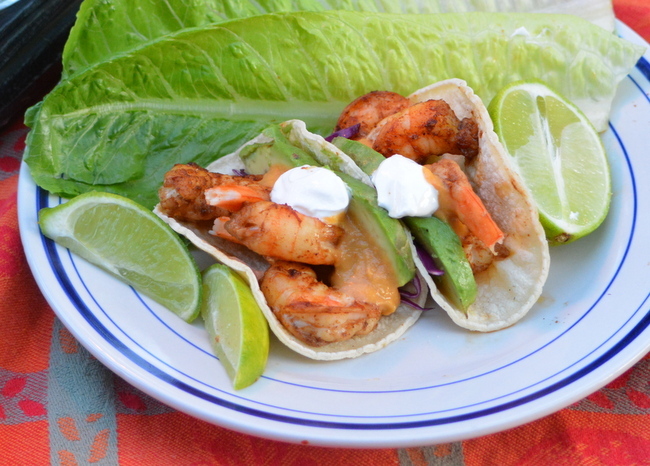 This is my little twist on the taco that packs plenty of flavor and spice. It’s perfect on a summer day with a white sangria and a bibb salad with a little mango salsa with a white balsamic vinaigrette. Mix the shrimp with olive oil, chili powder, lime juice, sale and red pepper flakes in a ziploc bag or sealed container and place in the refrigerator for one hour. For the sauce, blend all ingredients until smooth and set aside. The shrimp can be cooked under a hot broiler just until done (about 3 minutes) or over medium heat on a well oiled grill until just opaque for about 2 minutes per side. Warm the tortillas on the grill or in a pan with a dab of olive oil. 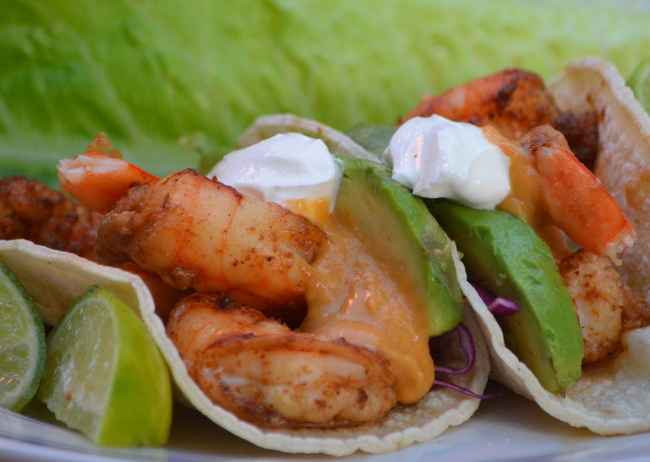 To assemble, place 2-3 shrimp into each tortilla. Top with one thin slice of avocado and a sprinkle of cabbage. Spoon sauce generously on top and add a small dollop of sour cream. Serve with lime wedges. You will have leftover shrimp, and they will be great in a salad tomorrow night!